Earlier this week, Elina hosted a fun get-together for some of her blogger friends. She asked everyone to bring an appetizer to share, and since it was a midweek event, I knew that I wanted to make something that wasn't too complicated, would be easy to transport, and didn't need to be cooked or heated immediately before serving. I also wanted to make something vegetarian, preferably vegan, and gluten-free, so that everyone would be able to try it. And finally, I wanted to make something featuring seasonal vegetables because I thought it would be nice for my dish to really reflect the theme of my blog. Well, that long list of requirements pretty much ruled out the apps I've made for my own parties in the past, so I started looking at new recipes. When I found this roasted red pepper and eggplant dip recipe in The Gourmet Cookbook, I knew it was perfect. The best part was that it is supposed to sit in the fridge for at least a day before serving so that the flavors can blend, which meant that I could make it over the weekend! I loved the balanced blend of flavors in this dip - it has sweetness from the roasted veggies, tanginess from the lemon, and a bit of a kick from the garlic and chile pepper. 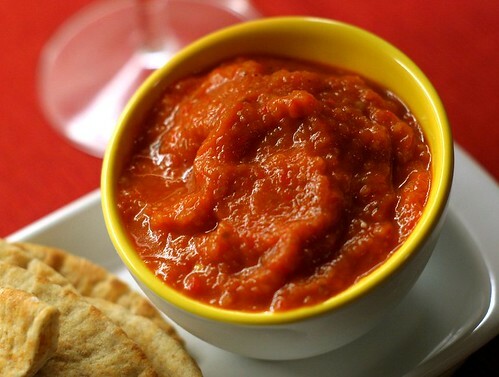 It's great with pitas or crackers, but it also makes a nice addition to pasta sauce and pairs really well with eggs. Although I was initially nervous about what dish to bring for a group of foodies, I think I chose wisely and I was glad to see that everyone else seemed to enjoy the dip as much as I did. I'm definitely going to think of this one next time I need a simple but interesting appetizer for a party! Do you have a favorite dish to bring to potluck gatherings? Put a rack in the middle of the oven and preheat oven to 400 deg F. Place eggplant and bell peppers on a baking sheet and roast in the preheated oven, turning vegetables a couple times, until bell peppers are lightly charred (30-40 minutes) and eggplant is very soft (40-50 minutes). When peppers are done roasting, transfer them to a large bowl, cover with plastic wrap, and let stand for 15-20 minutes. When eggplant is done roasting, let it cool for a few minutes. Put garlic and hot chiles in a food processor, and process until they are finely chopped. Peel the bell peppers, remove seeds, core, and ribs, and pat them dry. Put bell pepper flesh in the food processor. Cut the eggplant in half lengthwise and scoop out the flesh into the food processor. Add olive oil, lemon juice, and salt and process mixture until it forms a coarse puree. Transfer puree to a large, heavy saucepan and simmer, stirring frequently, until excess moisture has evaporated and mixture has reduced to about 3 cups, about 20 minutes (warning: it is likely to splatter as it bubbles). Season dip to taste with freshly ground black pepper and additional salt if needed. Let dip cool and then refrigerate in a covered container for at least 1 day to let the flavors blend. 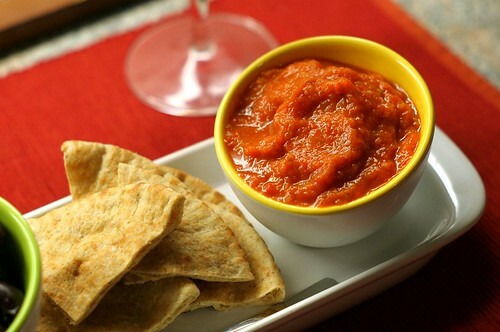 Serve at room temperature with pita bread or crackers. Leftover dip will keep well in the fridge for about a week. I own this cookbook and yet haven't seemed to have come across this recipe! It sounds like quite the winner. Perfect for dipping some pita chips in! A very considerate option for a group gathering! Great seeing you last week! I loved this dip as I'm a big fan of roasted eggplant. I always wonder what to do with eggplant- this looks perfect! I love how healthy this is! What a perfect dip! This was So good!!! So healthy too! Loved it!